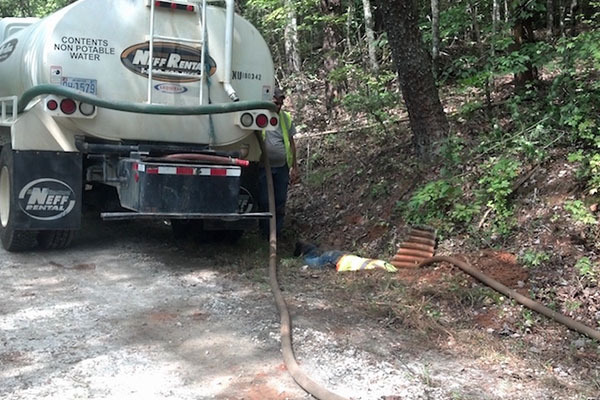 Hydra was awarded an IDIQ Contract for the Frances- Marion & Sumter National Forest Service. This contract includes various design and construction items such as, but not limited to, culvert cleaning, road re-construction, recreation area and trail design, overlooks, and road design. During the time period of this contract, Hydra will prepare all construction documents required and meet deadlines. Hydra Engineering & Construction provided design services for the decommissioning, reconstruction, and construction for approx. 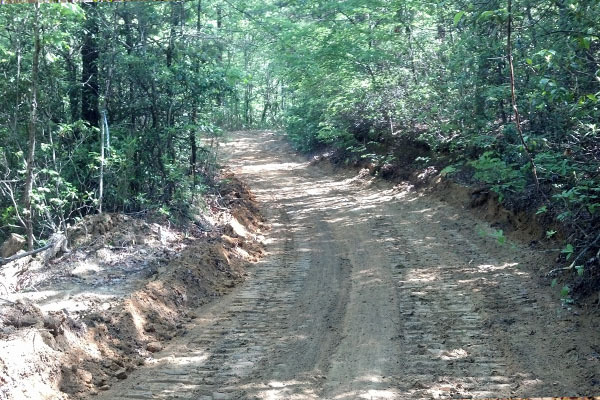 25 miles of roads located in the Enoree Ranger District. Construction included the decommissioning of 3.6 miles, reconstruction of 6 miles and the construction of 0.7 miles. 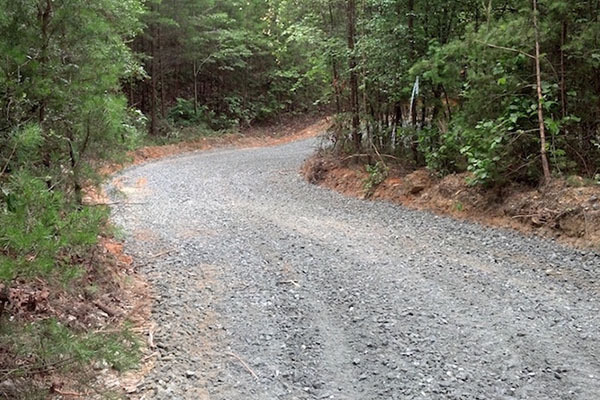 Hydra Engineering & Construction completed road reconditioning, cleaning culverts in place, and seeding and mulching using the dry method throughout the forest roads in the Francis Marion & Sumter National Forest. This task included cleaning, re-pulling and reshaping ditches at culverts, and grade to drain the entire ditch system through the road. 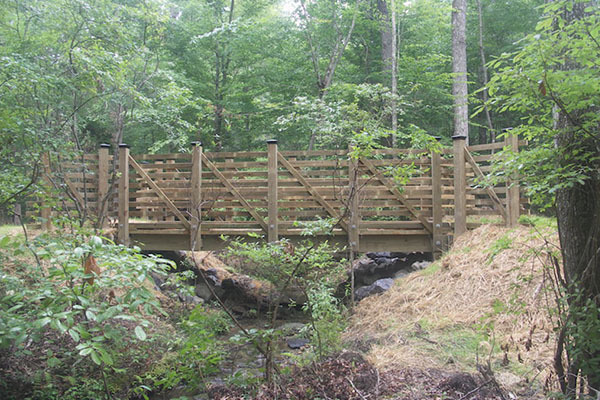 Hydra Engineering & Construction developed and provided the forest service design plans, specifications, bid documents and a construction cost estimate for a walking trail at Woodsferry Recreation Area along the Broad River located in Columbia, South Carolina. Hydra Engineering & Construction was contracted to provide rehabilitation of overlook and traffic control for the Wigington Overlook Parking Area. These services included selective clearing, removal of existing asphalt, power wash concrete sidewalk, mow grass and finish with a hot asphalt concrete mixture. 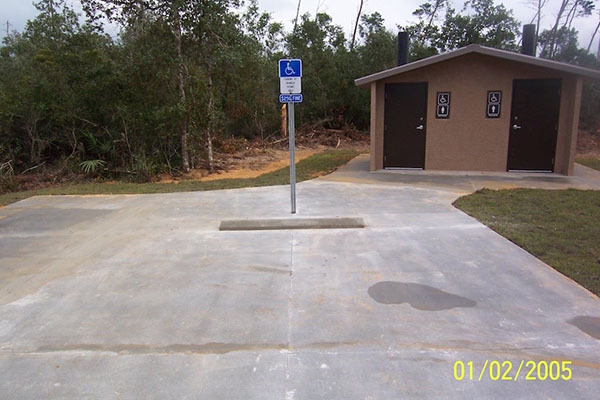 Hydra Engineering & Construction was the Prime Contractor for the installation of the improvements to the Cedar Point Campground including: a new block multi-use building, septic system and dump station, water lines, electric services and information booth lane. 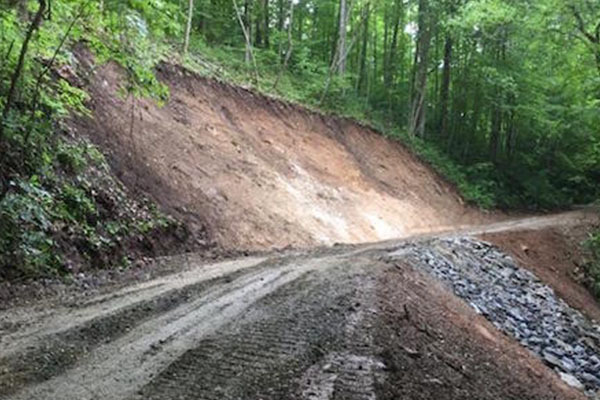 Hydra Engineering & Construction was the Prime Contractor responsible for Road Recondition by roto milling and completing slide repair on NFSR # 437 Rainbow Springs Road. Project included using a loader mounted rock crusher (Iron Wolf 840 Heavy Series) to complete the specified work. 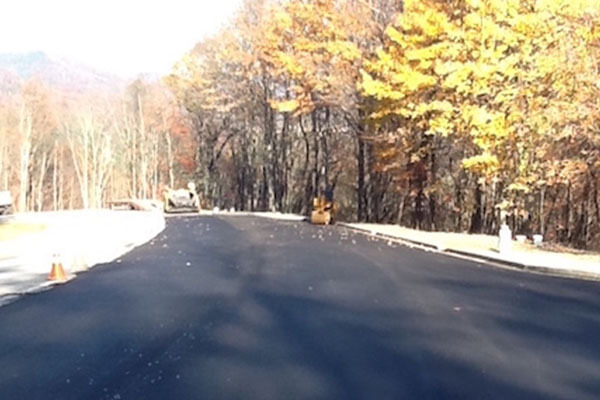 Road sections were milled along designated locations identified on National Forest System Roads. Existing crushed stone was mixed with imported NCDOT ABC stone aggregate with water and compacted with a vibratory roller as specified within the contract specifications. Road reconditioning also included ditching along these sections prior to grinding operations along with one fill slope slide road failure repair. Hydra Engineering & Construction was awarded a multiple-award IDIQ contract for maintenance, repair, remodeling, renovation, minor engineering/design and new construction services. The contract is to provide a range of general construction type projects including but not limited to administrative, recreational, housing facilities, and maintenance / laboratory facilities assigned to the National Forests throughout North Carolina and South Carolina. 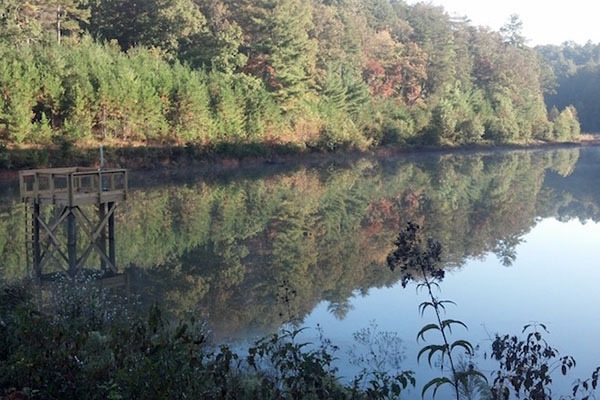 The Southern Research Station’s Coweeta Hydrologic Laboratory is located in Otto, North Carolina. The following scope of work is required for this project: Analytical Laboratory drainage, roofing replacements for two buildings, dormitory drainage and wall repairs, exterior painting on two buildings, and residence basement foundation drainage repairs. 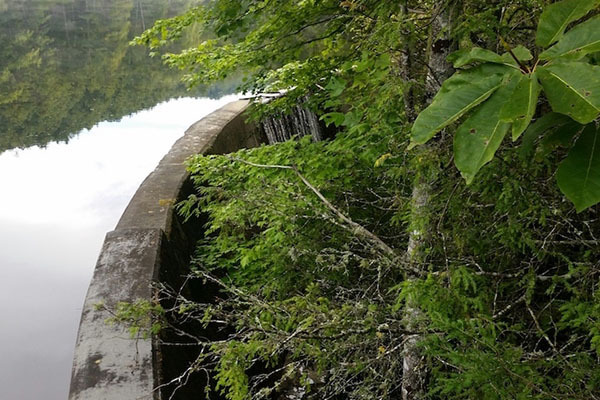 Hydra Engineering & Construction was awarded as the Prime Contractor responsible for the Skitty Creek Dam Repairs located at the Nantahala National Forest in North Carolina. The project scope of work includes: cast-in-place concrete, installing steel reinforcement bars, preparation and mixture design of concrete, design and construction of all required form work according to ACI 301, place and secure anchorage devices, and smooth rubbed finishing. 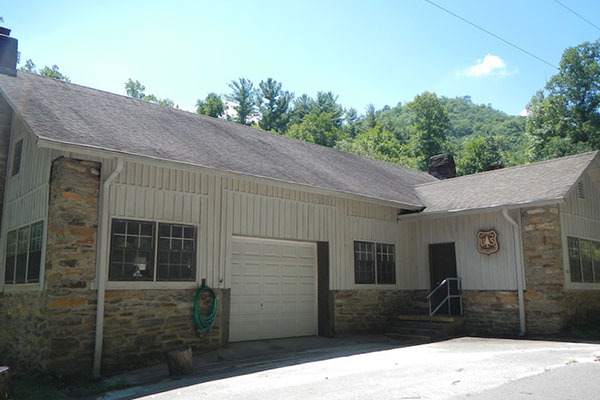 Hydra Engineering & Construction was awarded as the Prime Contractor for the HVAC repairs located at the Cradle of Forestry Discover Center in Pisgah Forest, North Carolina. There were multiple issues involving the HVAC systems that required immediate attention. Several of the HVAC units were non-operational and needed to be repaired/replaced due to leaks, circuit failures, or compressor related issues. Hydra Engineering & Construction was awarded the design / build of the Llewellyn Branch Trail Bridge project located in North Carolina. Hydra was responsible for the design of all bridge components and the design was required to include a hydrologic/hydraulic study of the bridge. All of Hydra’s designs are required to comply with AASHTO, OSHA and ADA standards. In addition, Hydra submitted an erosion control plan, which will minimize the movement of construction sediment and all bare soil shall be revegetated. 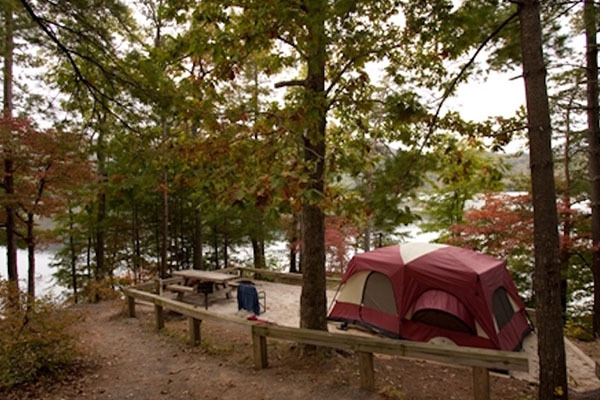 Hydra Engineering & Construction was awarded as the Prime Contractor for the construction and rehabilitation of campsites at Cedar Point Campgrounds on the National Forest in North Carolina. The scope of work included installation of Mirafi 600X Fabric, placement of 6” and 8” ft. of stone base, installation of 6×8 PT Timbers, 2” ft. of S9.5B pavement and rock dust, installation of picnic tables and lantern holders and installing specified fire rings. 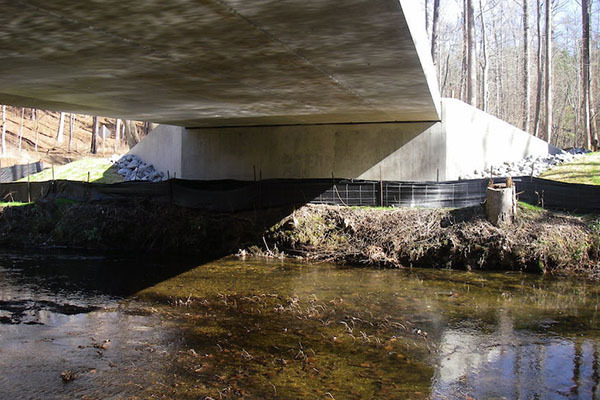 Hydra Engineering & Construction was the Designer and Prime Contractor for a Design / Build contract for the Replacement of the Cheaha Creek Bridge on National Forest System Road 637 in Talladega National Forest. The existing structure is to be removed. The proposed structure was designed to provide 5’ of free board during the 50 year storm event. The design analysis looked at options to mitigate potential impacts to Threatened and Endangered Species found in the project area. The proposed bridge is a pre-stressed concrete box beam, 65ft. Long and a clear roadway width of 18’ – 1.5”. Hydra Engineering & Construction was the Designer and Prime Contractor for a Design / Build historic preservation project. 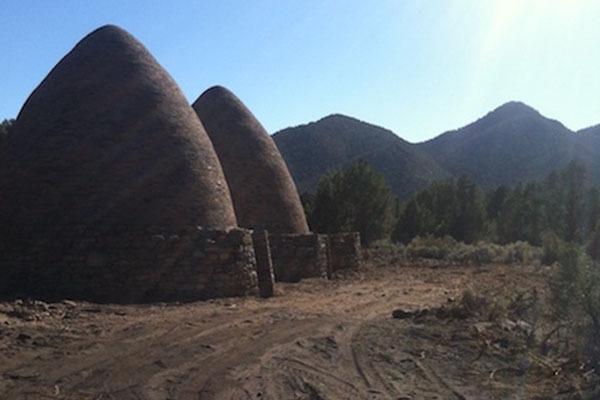 The Hot Creek Kiln Stabilization project consisted of five individual sites with beehive shaped kilns constructed of brick or native stone. The sites were in remote locations and the kilns were restored with bricks and mortar of similar composition as the existing structures. Hydra Engineering & Construction was the Prime Contractor. 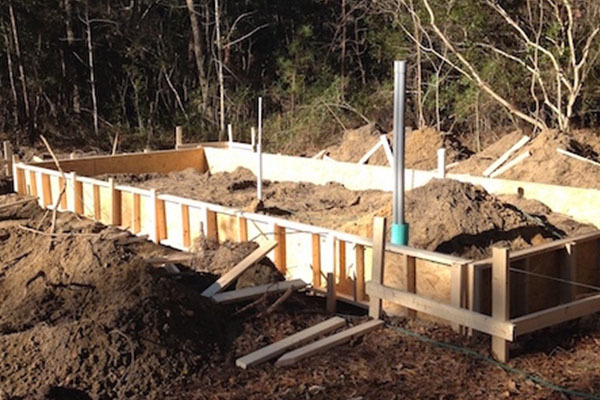 This project required installation of approximately 1,090 linear feet of new waterline ofvarious sizes at the Forestry Sciences Laboratory campus located in Research Triangle Park, North Carolina. 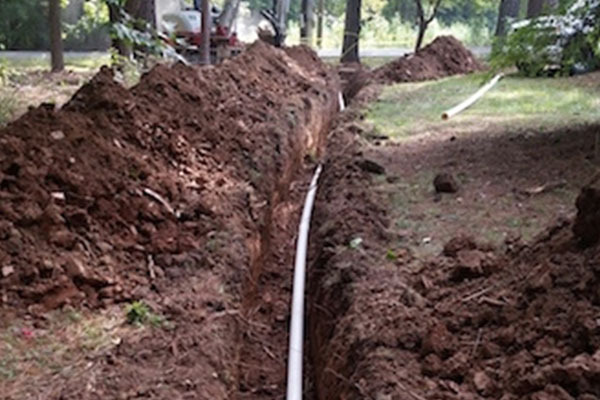 Hydra was responsible for protecting the line and maintain potable water to the site until the new distribution line was installed. Hydra installed new waterlines, thrust blocks and new valves,as well as installation of new concrete pad for drainage improvements. 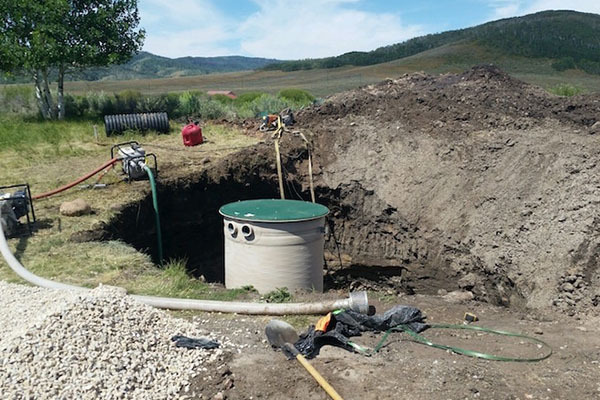 Hydra Engineering & Construction was the Prime Contractor of this project, located in the HeberKamas Ranger District of the Uinta-Wasatch-Cache National Forest in Utah. The project included the removal of an existing lift station and wet well, and the installation of a new lift station. Mobilization,removal and disposal of existing structures, 1,500 gallon emergency storage tank, electrical distribution system, and special bedding were all required to successfully complete this project. Hydra Engineering & Construction was the Prime Contractor. This project was located at the Chattahoochee National Forest in Georgia. 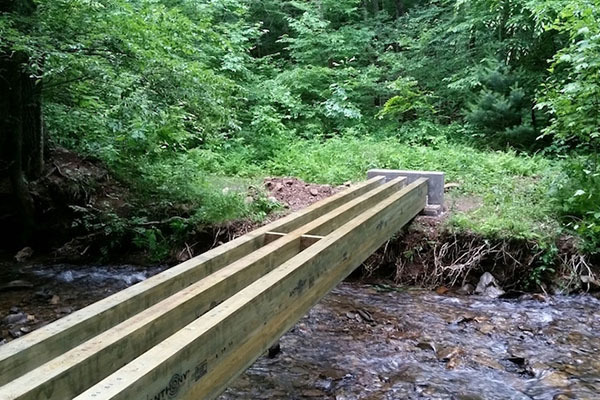 This project included removing the existing bridge off of National Forest System lands and replacing it with a standard design laminated trail bridge. Hydra provided the approaches, substructure, and superstructure consisting of laminated wood beams.The trail bridge is 30 ft. long. The deck was constructed three feet above the existing grade. This project provided a graded pond bottom to allow complete drainage of this complete pond area through a newly installed outfall structure to allow annual maintenance of this waterfowl habitat. Work included clearing, grubbing, and grading existing pond bottom, using cut dirt to raiselevee areas around pond, demo five existing culverts and replace with 24″ RCP in two locations,construct concrete outfall structure with sluice gate, trash racks, and boardwalk for access, and seed disturbed areas on levee. 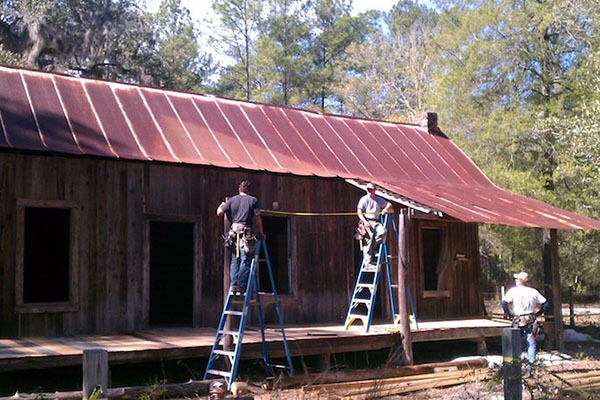 Hydra Engineering & Construction performed the repairs to the roof, porch and deck to the historic Langston house. They worked closely with the Forest Service’s Archaeologist to ensure the historic preservation of the structure was maintained. The decommissioning of FSR 326 included removal of the existing concrete box culvert,restoring the banks of the stream bed, installing the recycled guardrail to close off the road at each end, installing berms with trees along the top to both deter traffic and slow the storm water runoff from directly entering the stream and placing seed and mulch to reduce erosion and help restore habitat. 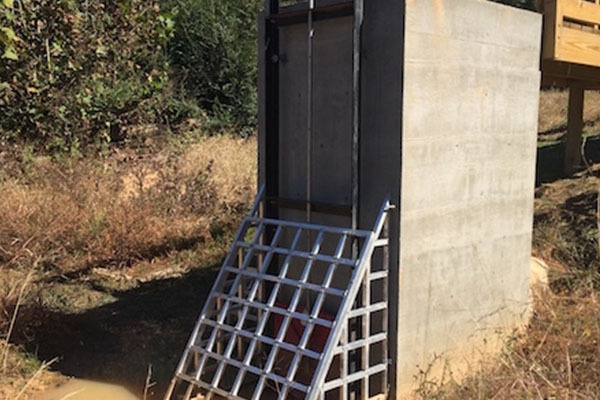 Hydra Engineering & Construction was the Engineer and Prime Contractor for repairing the outfall for the dam facility by installing a new 30″ stainless steel slide gate and elevated platform. 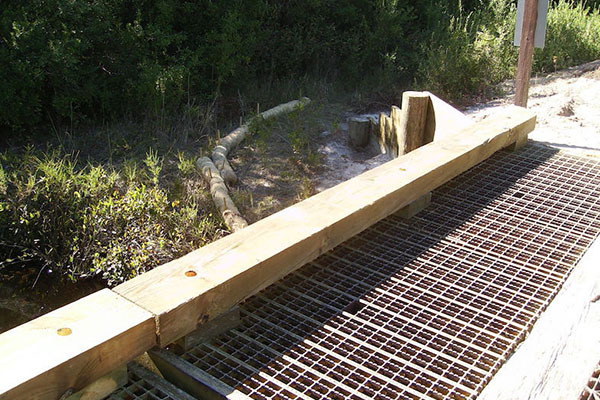 Hydra Engineering & Construction was the engineer and contractor for the installation of a timber horse trail bridge and all appurtenances that included gravel approaches to abutments, railings,bridge decking, and running surface. Hydra had to utilize erosion control measures within the creek,compliant with Georgia Sediment Control standards to provide an environmental friendly work area. Hydra Engineering & Construction performed the design development, construction documents,permitting and reconstruction of approximately 6 miles of Forest Service Road 707, incorporating sustainable design principles. 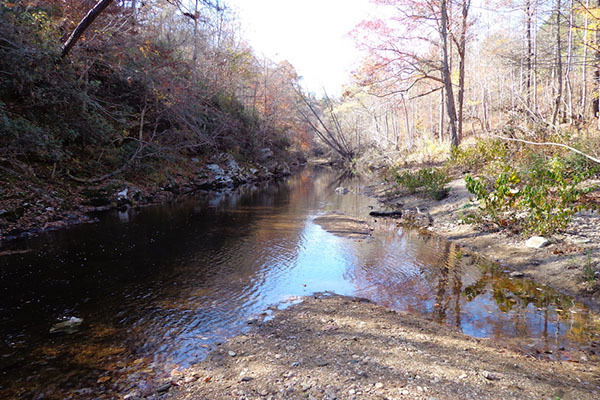 Hydra Engineering & Construction performed the design and implemented the plans to maintain and reconstruct approximately 5 miles of trails along the Chattooga River. Hydra Engineering & Construction performed the design for the replacement of the Pine Glen Bridge.The design required relocation of new segments of forest service road on both approaches to the new bridges and provide access to Pine Glen Campground from the new road segment. Hydra prepared the bridge designs, hydro logic and hydraulic analysis, specifications, calculations and design load rating. 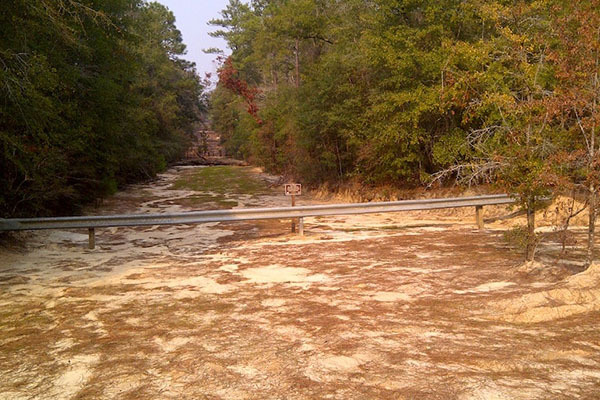 Hydra Engineering & Construction was contracted to complete maintenance on 16 Bridges in the Western part of the Apalachicola National Forest. Work completed on all bridges included removing vegetation from around the abutments and wing walls, removal of debris from the bridge decks, resealing existing expansion joints, installing lime rock at the approaches to the bridges, repairing any spawling and replacing any missing hardware. The project was funded through the American Reinvestment and Recovery Act. Hydra prepared all the reporting as required by the ARRA. All four wing walls on four of the bridges were removed and new pilings and sheeting boards were installed.Another bridge had a single wing wall replaced with new pilings and sheeting boards and rotten sheeting boards were removed and replaced in several other locations. Approach guardrail was placed on approaches on 4 bridges and bag rip rap was replaced as needed on several of the bridges. 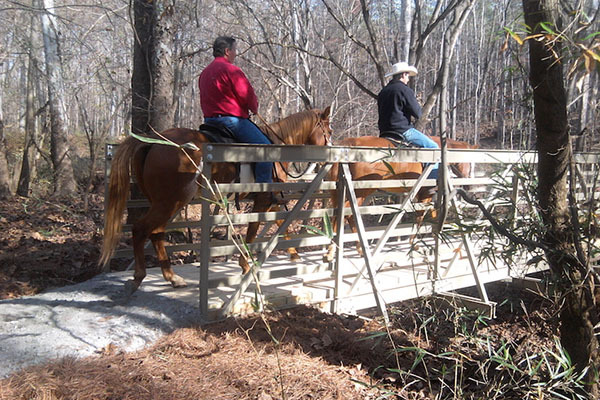 Hydra Engineering & Construction was the design firm and Prime Contractor for the Equestrian Bridges located in the Talladega National Forest in Alabama. The project includes the construction of two single span wood equestrian bridges and associated approaches. The bridges have spans of 28’and 20’ and have been placed to have no impact on wetlands or waters of the United States. The longer of the two bridges has been designed using a glue laminate beam and the shorter one utilizes dimensional lumber for the beam. The bridges have been designed to carry 5 tons allowing the bridges to also be utilized for emergency recovery equipment if the need should arise. The project also included two stream-bed culvert crossings and six areas of trail improvements consisting of“drainage sausages” to improve the riding path. The project was funded through the American Reinvestment and Recovery Act. Hydra prepared all the reporting as required by the ARRA.